Four recent incidents illustrate how American Jewish institutions are manipulated to subvert support for Israel. Call it the fairness trap. Vassar Hillel announced it would join its counterpart at Swarthmore and reject Hillel International's guidelines prohibiting anti-Israel speakers and activities. The "Open Hillel" movement represents these restrictions as unfair censorship. Ramaz High School in Manhattan, a Modern Orthodox flagship, rescinded an invitation from a student group to Columbia University professor Rashid Khalidi, a passionate opponent of Israel. 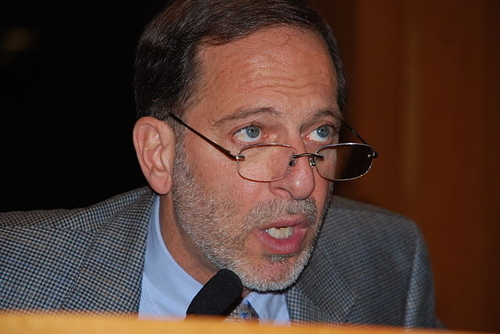 A petition then called for Khalidi to appear in the name of "academic equitability." The Museum of Jewish Heritage invited, disinvited and the reinvited John Judis to speak. Judis is the author of a shallow and tendentious new book on President Harry Truman and the origins of Israel. The museum director complained about the "ugly specter of succumbing to pressure and giving in to outside influence." Philosopher Judith Butler canceled her appearance at a Kafka-related event at the Jewish Museum following an outcry regarding her passionate anti-Zionism. In all these cases leading Jewish institutions were willing to open their facilities and lend their names to anti-Israel voices in the name of 'fairness,' 'openness' and 'dialogue.' Protests were then condemned as 'censorship" and 'delegitimization.' The need to invite anti-Zionists into Jewish institutions, when these individuals and their viewpoints are widely known and available, is simply taken for granted. Jewish institutions, whatever their purpose or orientation must be open to even antithetical viewpoints and be seen doing so. That is the trap. Jewish institutions are damned if they do and damned if they don't. What is remarkable is not that these manipulations go on but rather how transparent and shameless they are. They take advantage of what has become a defining characteristic of the American Jewish community, an obsession with fairness and balance, an eagerness to listen to and internalize the narratives of others, to be "other directed," guided by external trends and standards. Sometimes this is justified as a Jewish value, akin to the ever-malleable concept of "tikkun olam," and sometimes as an American value. And of course there are kernels of truth to this. But it is dramatically one-sided. Rarely are there comparable gesture by non-Jewish institutions, secular or religious. The Friends Seminary school in New York City felt perfectly comfortable inviting anti-Zionist and antisemite Gilad Atzmon to present his views. A few polite complaints from a handful of Jewish students and parents were swept aside. No balance was required. The Newton Massachusetts school system comfortably went into lockdown when it was revealed that high school students were being taught Islamist propaganda about the Middle East. No balance was desired. The K-12 outreach to high schools by Federally funded Title VI Middle East Studies centers across the country presents doctrinaire perspectives about the glories of the Arab world and Islam and either ignore or criticize Israel. No balance is available. The same trap exists for Jewish Studies programs at American colleges and universities. They are expected to co-sponsor anti-Zionist speakers and events. When they do, they give their imprimatur, and as often as not a well-intentioned scholar of Jewish literature (or worse yet, Hillel professionals) has to debate a professional Palestinian. When they don't, they are dismissed as bigoted, and their adversaries represent themselves as paragons of fairness and inclusion. Middle East Studies programs often get around this by presenting anti-Zionist Israelis. These incidents point to an uncomfortable reality of American Jewish life. There is no institution, no space, no conversation that is immune from anti-Zionism. At every turn Jews in their communal homes are required, often by other Jews, to debate Israel. As often as not the terms of the conversation are harsh and prejudicial; ethnic cleansing, apartheid, boycott, the one-state solution. This increasingly pertains to synagogues and communal organizations as much as to educational and cultural ones. From the anti-Zionist side one could say that this is a curse brought about by Zionism and Israel. But the relentless way that anti-Zionism forces itself into every space and every conversation is indicative of something else. In some cases antisemitism is at work – in this worldview of course Jews are ubiquitous and all-powerful. But in others, like Jewish institutional life, there is obsessiveness that suggests a pathology. Why the absolute need to debate the place of Jews in the world everywhere, and to present the evil of Israel, even in Jewish institutions? Objectively this is hardly the paramount question of the day. But there seems to be an inverse relationship at work – the greater the problems of the world and the Middle East, the greater the focus on the Jews and Israel. It is as if the more Syrians die, the greater the demand that Israel be debated (and denigrated), in the interest of "fairness." Is the emphasis an attempt to expiate inaction there or elsewhere, a quest for moral purity, or something else? At the root is the problem of Jewish power. One of the great impulses to Jewish outer-directed in America has been the real and perceived need to avoid appearing selfish. The bulk of American Jewish economic power has long been channeled into philanthropy directed at the non-Jewish world, primarily universities, hospitals and museums. Whether this came from a perceived need to be accepted (or tolerated), the result is that the most visible displays of Jewish power do not benefit Jews. The periodic waves of revulsion expressed against AIPAC are a rejection of Jewish political power that defends a particular cause, Israel. Now whatever power that comes from having private or protected Jewish spaces must be relinquished in the name of "fairness." It seems likely that the ultimate goal is Jewish powerless. Much as only Israel is required to make compromises for peace, ranging from ceding territory to self-abolition, only American Jews are required to open their institutions to "competing narratives," and only they are condemned as bigots if they refuse. With the trap thus sprung, the future of American Jewish institutions is more fraught than ever.